If it is your desire to live in a highly esteemed desert community, consider buying a home in Fireside at Desert Ridge. Fireside at Desert Ridge perfectly balances the urban and suburban atmosphere with both convenience and privacy, relaxed and upscale ambiance. Residents of Fireside at Desert Ridge enjoy immediate access to the 101 making all the impressive amenities of the valley easily accessible. For those that enjoy day trips and adventure, San Diego and Las Vegas are only 5 hours away. Fireside at Desert Ridge is served by the top ranked Fireside Elementary and Pinnacle High schools in the prestigious Paradise Valley Unified School District. 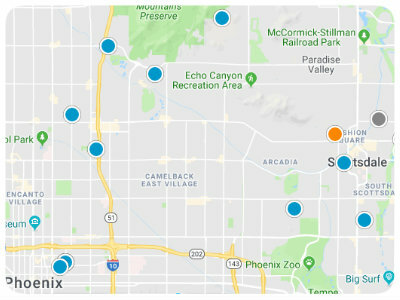 In addition to excellent education, residents also enjoy convenient shopping and dining at the Desert Ridge Marketplace and CityCenter of CityNorth. This master-planned gated community has great amenities including a community center with multiple pools, spa, tennis and basketball courts, and a fitness center. Homes for sale in Fireside at Desert Ridge vary in size and features. For example, the Infinity Series of townhomes in this sophisticated suburban community range from 1,926 to 2,405 square feet of living space. These townhomes boast two-car attached garages, Rotunda foyers and courtyards. Comparatively, the Eternal series of townhomes are detached cottages ranging from 1,448 to 1,870 square feet of living space with two-car garages. While there are sometimes exceptions, Fireside at Desert Ridge homes typically range in price from $389,000 to $529,000. If you would like to buy a home in Fireside at Desert Ridge in Phoenix, Arizona, please do not hesitate to contact us today for more information.